Like many undergraduates, Christina Rossetti, a senior psychology major from Mount Laurel, New Jersey, first came to college without a concrete idea of her career goal. “I was interested in law and psychology,” says Rossetti, who’s been a fixture on the dean’s list since arriving on Hawk Hill in 2013. Nearly four years later, she has discerned her career goals. With a destination clearly in mind, Rossetti, a member of the psychology and Spanish honor societies, was looking for a roadmap to plot her route. She turned to SJU Connects, the Alumni Association’s online career-advising platform, and sought the advice of National Alumni Board member John M. Bradley ’98 (B.S.). A University of Pennsylvania Law School lecturer, Bradley had worked as a business litigator and non-profit in-house counsel. 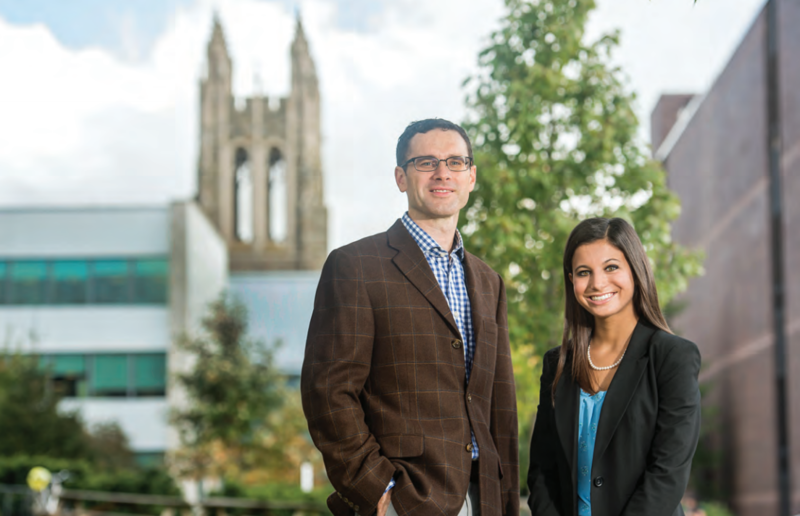 Through a secure platform, advisors in SJU Connects engage students and alumni in career conversations, resume critiques and mock interviews. Since its 2015 launch, the platform has attracted 579 advisors and 611 advisees, with more than 190 connections already established. “When I saw Professor Bradley’s accomplishments, I knew that he would be the perfect person to talk with about my future,” Rossetti says. “SJU Connects was a great way to have a personal conversation and ask him questions about legal careers, law school and law school admission.